Our Slimmers' Choice Matcha Blend has been specially chosen for those looking to lose weight by those who are losing it. We often get asked which matcha is best for weight loss and this is our pick. Why? Great on it's own or mixed with other things. Easier to drink than cheaper matchas. Not paying for a flavour profile that you may not appreciate. 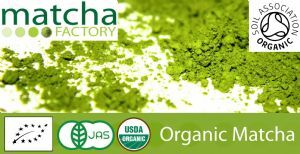 Our matcha is certified organic by Soil Associtation.